I learned a few things about myself while thinking through this post. The first is that it is harder for me to write about events that are similar to what I have done before. It just feels like it is becoming a boring checklist of carried this thing this far, completed this obstacle, failed that one, this thing was hard, that sucked a lot, then there was the new obstacle that everyone is talking about, I thought it was garbage. It loses the feel of the event and becomes incredibly irritating to write. There have been times when I simply skipped writing about an event when I couldn’t think of anything new to say. So I hope you will forgive that this (and I am sure future posts) will omit some details that I have written about before to focus on new developments. I ran this with my son Josh again this year, who is at that point in growing where he is a bit bigger and heavier than last year, but the proportional increase in strength has not arrived yet. He was feeling dejected and unsure of himself after a few obstacles that he remembered being easier last year (and remembering that running down a basketball court is a whole different thing than running up ski slopes.) I had him grab onto my pack on uphills, towed him up and then we walked/jogged the downhills. I encouraged him and helped him on whatever obstacles I could, and on most of them he did okay. On the bucket carry, I would take my bucket as far as I could up the hill, run back to wherever he had gotten it to, bring his up even with mine, do it again. I love the picture above, as I think it is the only time I have ever been photographed carrying the bucket at a trot. For the record, he did move his a good distance on his own. At the dunk wall, I put the hand that happened to be carrying my hydration pack under the wall, then gave Josh a quick pep talk before going under. Unbeknownst to me, the photographer on the other side was concerned at seeing a pack float up and not seeing anyone immediately follow it. A lesson learned at the rope climb: make sure you train in the actual gear you will race in. I had used a different type of shoes that were great in the mud, but that couldn’t grip the rope. The way the ice bath last year was set up was on the very edge of being unsafe, and there were rumors that they had made it worse this year. 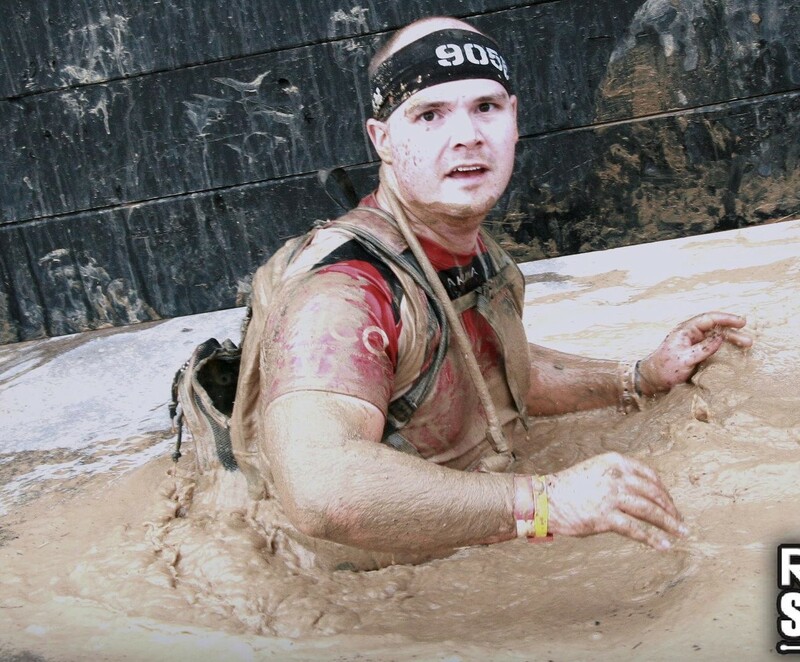 I ducked out of line to watch the Mudders in front of me going through the obstacle, and found the rumors to be untrue, and in fact the issue had been fixed rather than worsened. Drop ruck, slide down the tube, freeze everything, ruck up and move quickly to warm up. I forgot to mention that I was rucking with 20# this year, using it to complete one of my Pathfinder challenges. The blue foam thing attached to the ruck is a float for the drop-into-water obstacles. Shawshanked is an obstacle where you crawl up a tube and drop backward 6-8 feet into water. When I had done it before, I hadn’t realized what it was until I was too far into it to turn back. This time as I approached it, I realized I was honestly scared to do it. Which meant it was vital training and I had to do it. Drop ruck, put on the floatie, have a minor panic attack in the tube, make the drop. Successfully avoided drowning and continued on. I have no pictures, but I really think TM needs to post a photographer there. I saw two of the most awesome instances of teamwork among strangers that I have ever seen at this event. The first was a woman at Everest who attempted the run no less than 8 times, five of those making contact with my hand at the top but missing getting a grip on it. People behind us held my legs and the legs of the guy next to me so we could extend out a few more inches, then all of us worked together to pull her over. The second was at Pyramid Scheme. I don’t think more than two or three of them knew any of the others, but they formed into a team better than any group I have ever seen (to the point that when the next group coming up asked the volunteer how to complete the obstacle, she simply pointed to us and said “Watch them.”) Myself and another man formed the base, with a stack of people above us standing shoulder-on-shoulder. Those above then held from above as those below climbed over everyone to get to the top. I broke my water bladder somewhere around mile 4 and was dependent on the water stations for the rest of the course. Makes getting to the victory beer at the end all the more satisfying. Posted on July 23, 2017 by themonkofthemud. Bookmark the permalink.